Warm Up Determine if each statement is true or false. 1. The measure of an obtuse angle is less than 90°. 2. All perfect-square real numbers are positive. 1 Warm Up Determine if each statement is true or false. 1. The measure of an obtuse angle is less than 90°. 2. All perfect-square real numbers are positive. 3. Every prime number is odd. 4. Through any three points there is exactly one plane containing them. 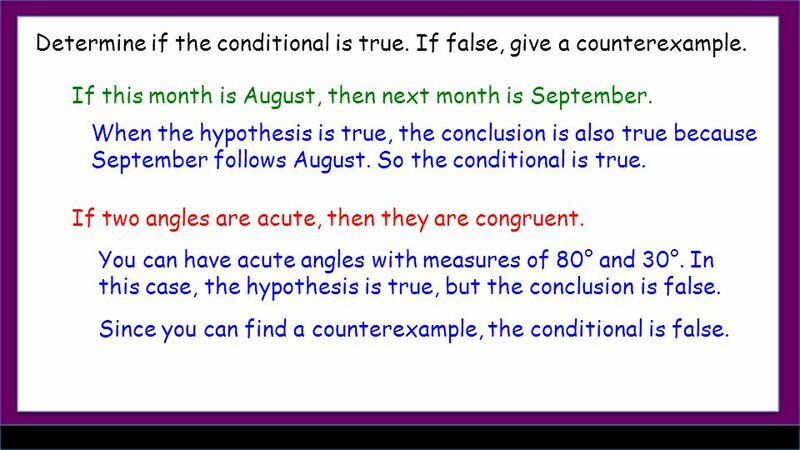 False False – counterexample? 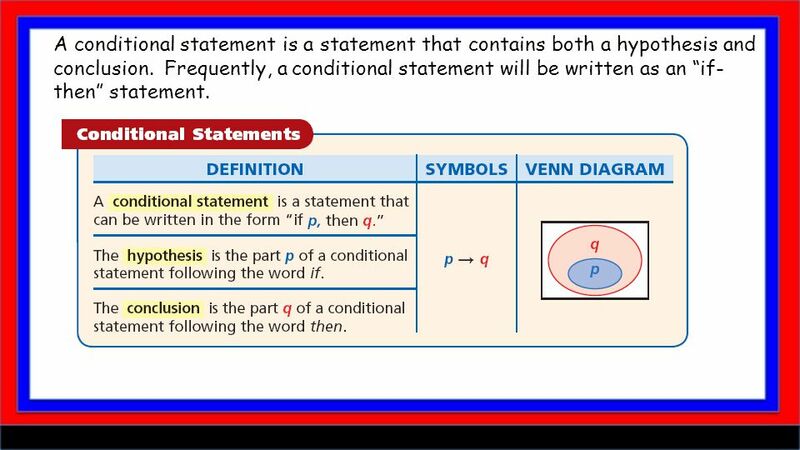 3 A conditional statement is a statement that contains both a hypothesis and conclusion. Frequently, a conditional statement will be written as an “if- then” statement. 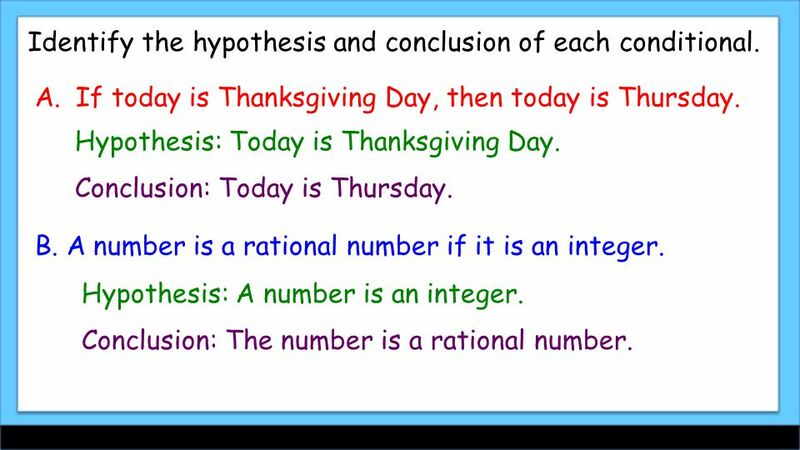 4 Identify the hypothesis and conclusion of each conditional. A.If today is Thanksgiving Day, then today is Thursday. B. A number is a rational number if it is an integer. Hypothesis: Today is Thanksgiving Day. Conclusion: Today is Thursday. Hypothesis: A number is an integer. Conclusion: The number is a rational number. 6 Many sentences without the words if and then can be written as conditionals. 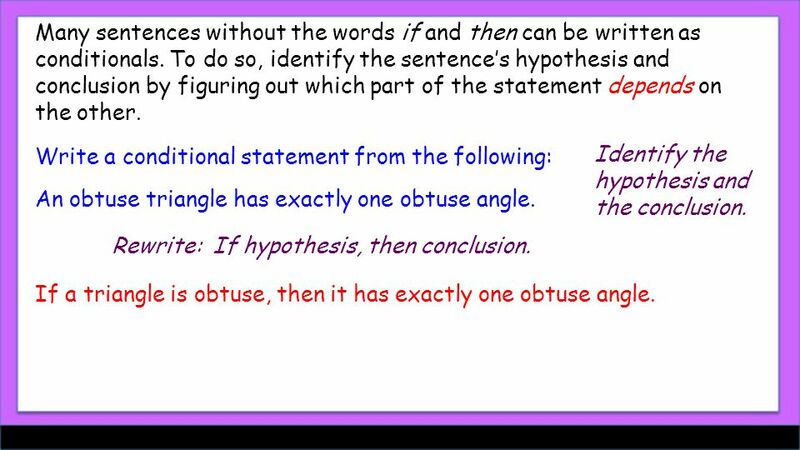 To do so, identify the sentence’s hypothesis and conclusion by figuring out which part of the statement depends on the other. Write a conditional statement from the following: An obtuse triangle has exactly one obtuse angle. Identify the hypothesis and the conclusion. If a triangle is obtuse, then it has exactly one obtuse angle. Rewrite: If hypothesis, then conclusion. 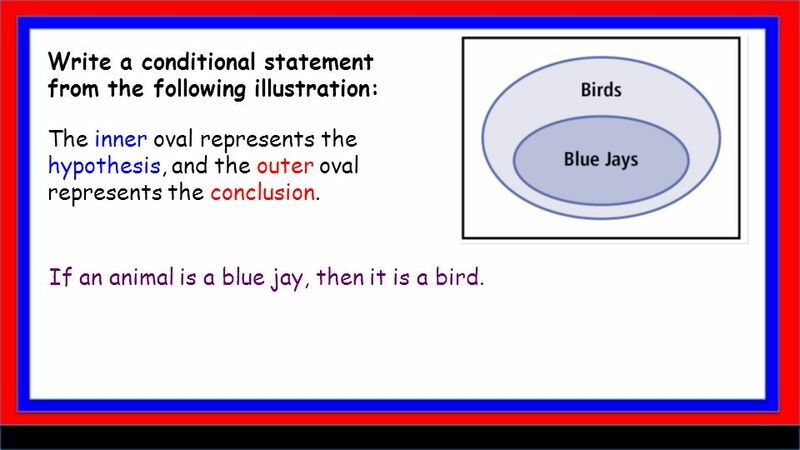 7 Write a conditional statement from the following illustration: If an animal is a blue jay, then it is a bird. The inner oval represents the hypothesis, and the outer oval represents the conclusion. 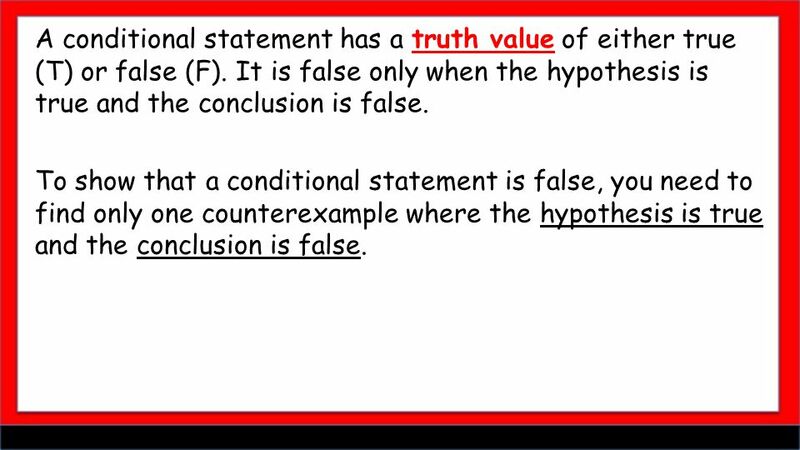 8 A conditional statement has a truth value of either true (T) or false (F). It is false only when the hypothesis is true and the conclusion is false. 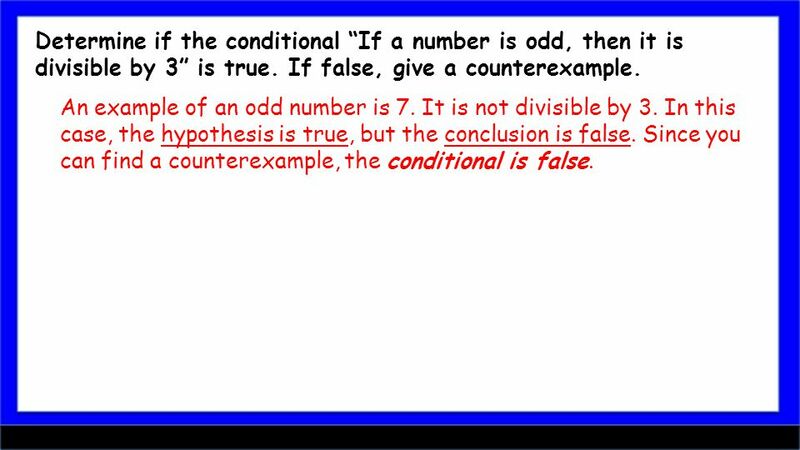 To show that a conditional statement is false, you need to find only one counterexample where the hypothesis is true and the conclusion is false. 9 Determine if the conditional is true. If false, give a counterexample. If this month is August, then next month is September. When the hypothesis is true, the conclusion is also true because September follows August. So the conditional is true. You can have acute angles with measures of 80° and 30°. In this case, the hypothesis is true, but the conclusion is false. If two angles are acute, then they are congruent. Since you can find a counterexample, the conditional is false. 10 Determine if the conditional is true. If false, give a counterexample. An even number greater than 2 will never be prime, so the hypothesis is false. 5 + 4 is not equal to 8, so the conclusion is false. If an even number greater than 2 is prime, then 5 + 4 = 8. Counter-intuitive, but important! 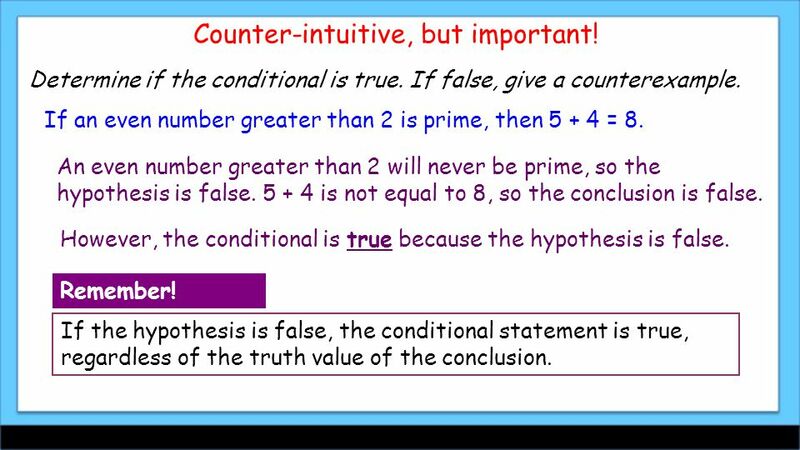 However, the conditional is true because the hypothesis is false. If the hypothesis is false, the conditional statement is true, regardless of the truth value of the conclusion. Remember! 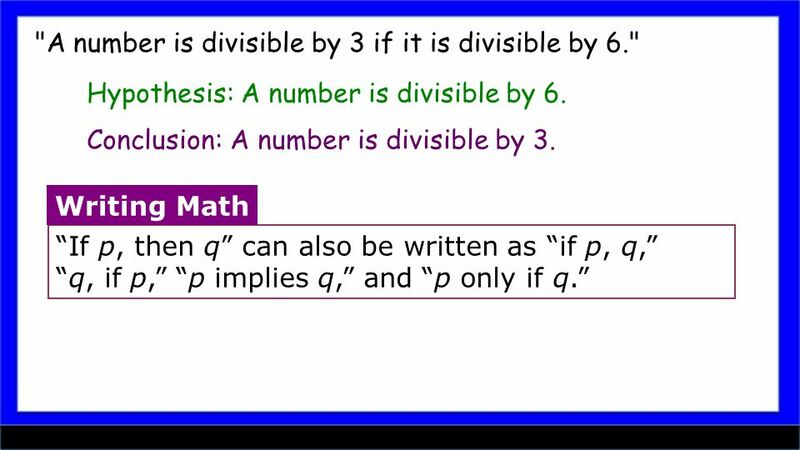 11 Determine if the conditional “If a number is odd, then it is divisible by 3” is true. If false, give a counterexample. An example of an odd number is 7. It is not divisible by 3. In this case, the hypothesis is true, but the conclusion is false. Since you can find a counterexample, the conditional is false. 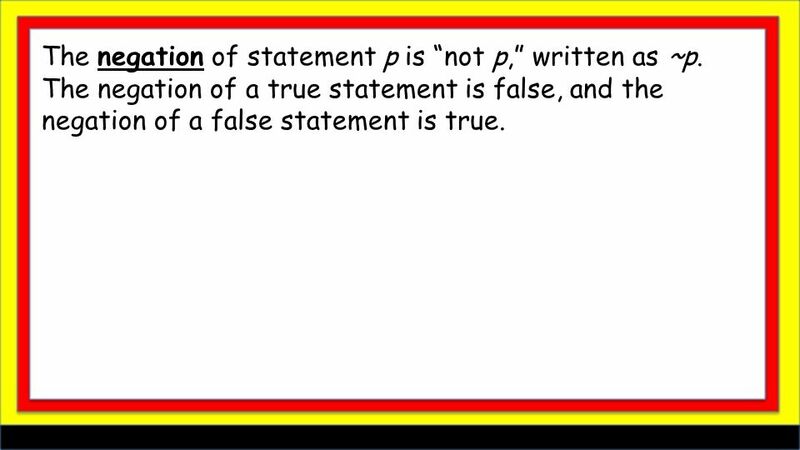 12 The negation of statement p is “not p,” written as ~p. The negation of a true statement is false, and the negation of a false statement is true. 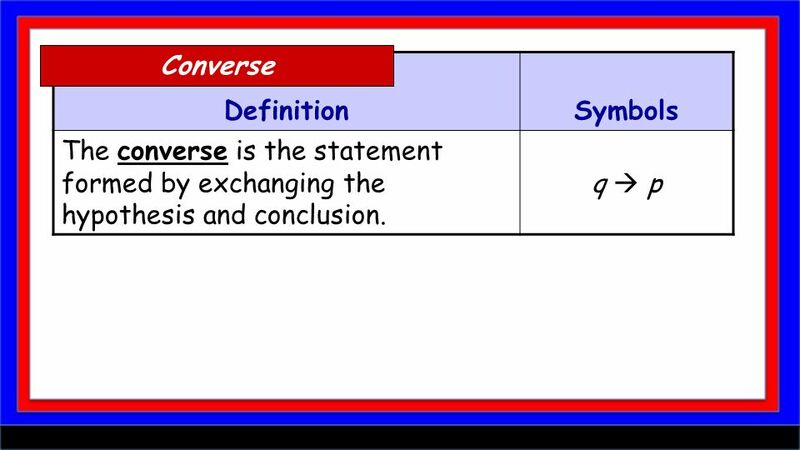 17 Write the converse, inverse, and contrapositive of the conditional statement. 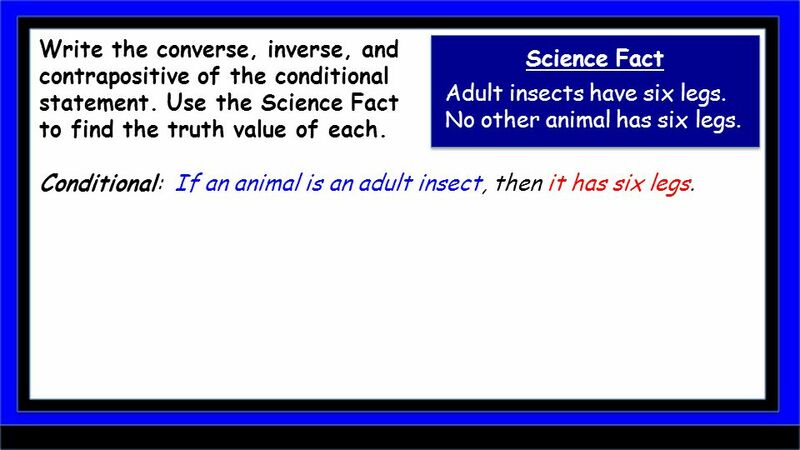 Use the Science Fact to find the truth value of each. Science Fact Adult insects have six legs. No other animal has six legs. Conditional: If an animal is an adult insect, then it has six legs. 18 Inverse: If an animal is not an adult insect, then it does not have six legs. Converse: If an animal has six legs, then it is an adult insect. Conditional: If an animal is an adult insect, then it has six legs. No other animals have six legs so the converse is true. 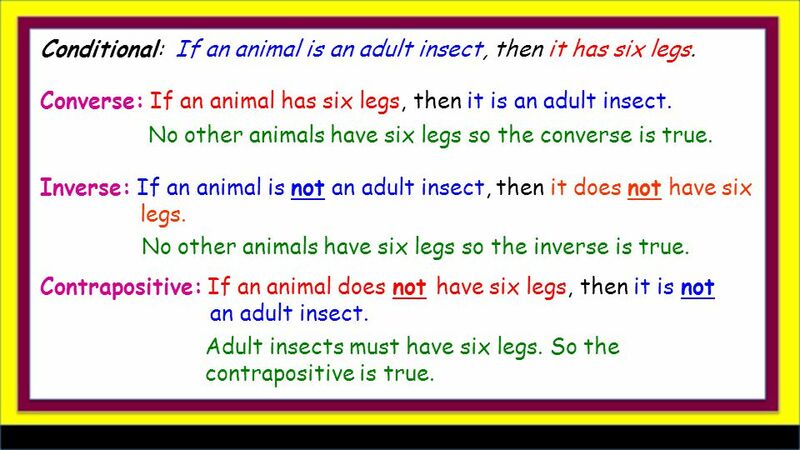 Contrapositive: If an animal does not have six legs, then it is not an adult insect. Adult insects must have six legs. So the contrapositive is true. No other animals have six legs so the inverse is true. 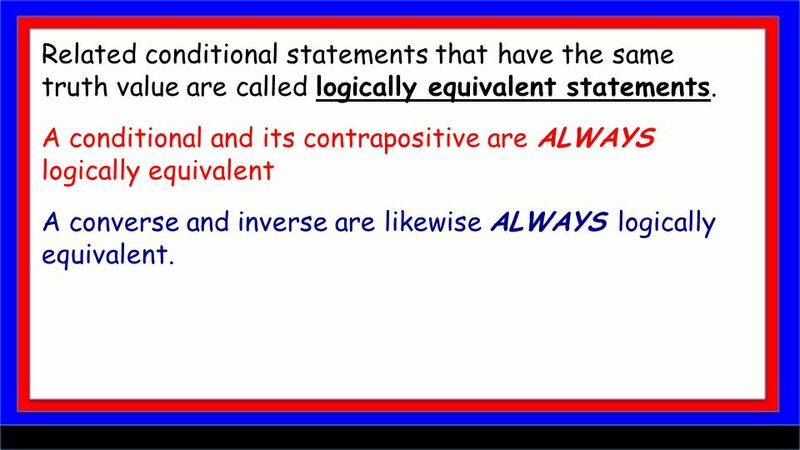 19 Related conditional statements that have the same truth value are called logically equivalent statements. 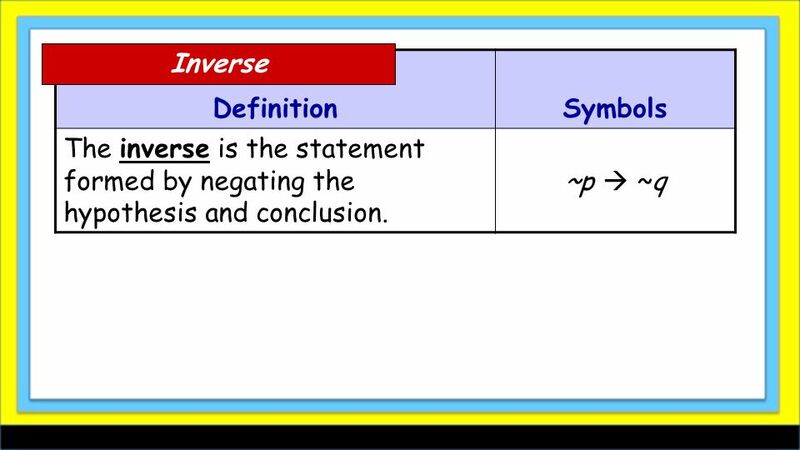 A conditional and its contrapositive are ALWAYS logically equivalent A converse and inverse are likewise ALWAYS logically equivalent. 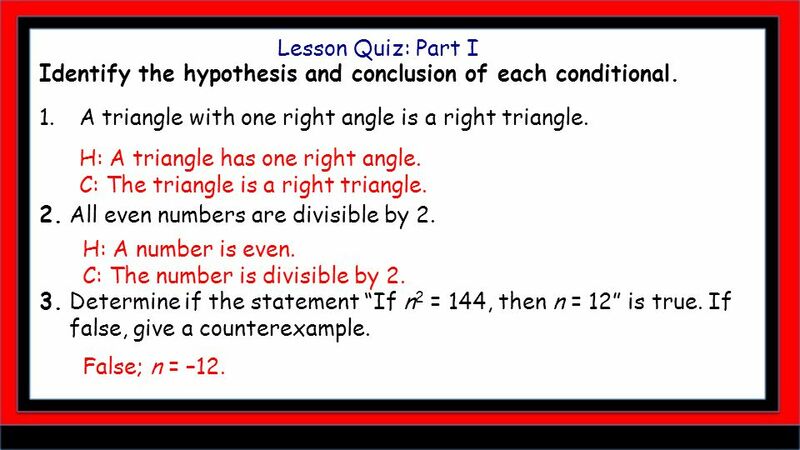 20 Lesson Quiz: Part I Identify the hypothesis and conclusion of each conditional. 1.A triangle with one right angle is a right triangle. 2. All even numbers are divisible by 2. 3. Determine if the statement “If n 2 = 144, then n = 12” is true. If false, give a counterexample. H: A number is even. C: The number is divisible by 2. H: A triangle has one right angle. C: The triangle is a right triangle. False; n = –12. 21 4. 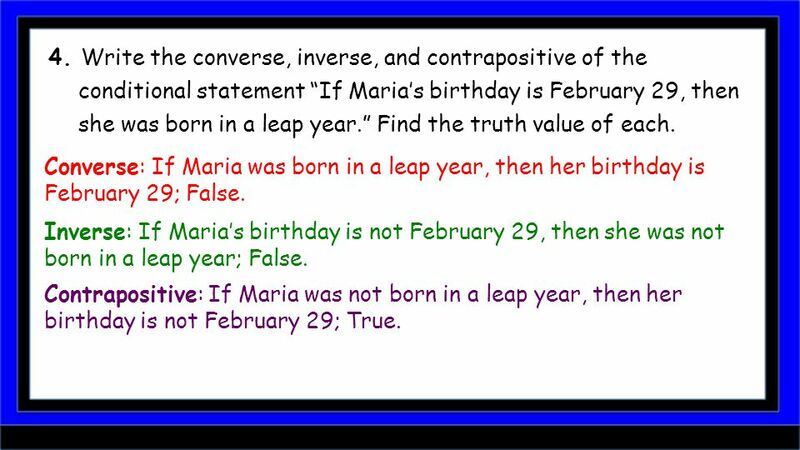 Write the converse, inverse, and contrapositive of the conditional statement “If Maria’s birthday is February 29, then she was born in a leap year.” Find the truth value of each. Converse: If Maria was born in a leap year, then her birthday is February 29; False. Inverse: If Maria’s birthday is not February 29, then she was not born in a leap year; False. Contrapositive: If Maria was not born in a leap year, then her birthday is not February 29; True. 22 Assignment today is page 85: 13-17 odd, 19-22, 24-29, 34-36, 38-40, 50-53 and 58- 60. Remember that homework help is always available at http://www.thinkcentral.com/index.htm http://www.thinkcentral.com/index.htm Today’s keyword is “MG7 2-2”. 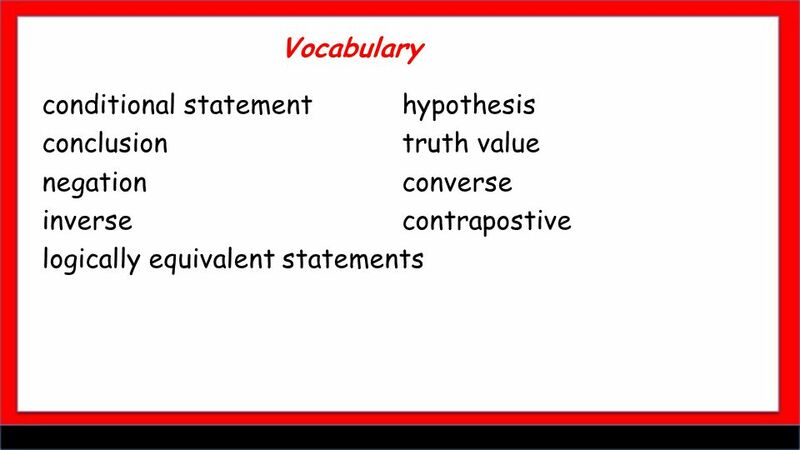 Download ppt "Warm Up Determine if each statement is true or false. 1. The measure of an obtuse angle is less than 90°. 2. All perfect-square real numbers are positive." 9/2/2008 Warm Up Complete the conjecture by looking for a pattern in the diagram below. The number of sides of a polygon that has n vertices is________________. Warm Up Identify the hypothesis and conclusion of each conditional. Determine if each statement is true or false. Warm Up Write a conditional statement questions 1 and The intersection of two lines is a point. 2. An odd number is one more than a multiple of 2. When several examples form a pattern and you assume the pattern will continue, you are applying inductive reasoning. Inductive reasoning is the process. 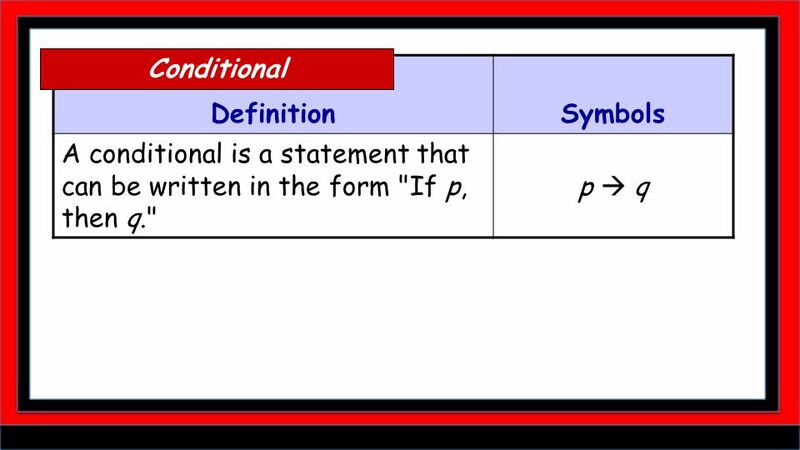 2.2 Conditional Statements Goal: Students will be able:  To recognize conditional statements and their parts.  To write converses, inverses, and contrapositives. 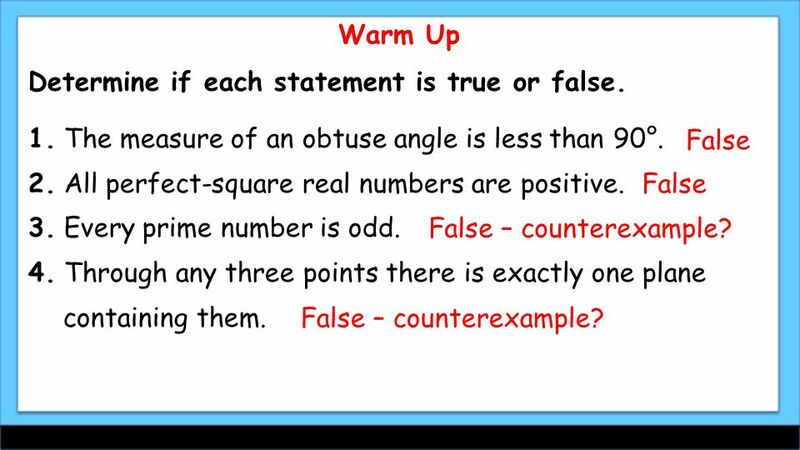 Warm Up: For the given statement, determine the converse, inverse, and contrapositive. Assuming the given statement is true, determine if each new statement. Conditional Statements and Logic 2.2 Ms. Verdino. Conditional Statements youtube. com/watch SOL: G.1a SEC: 2.3. Warm Up Determine if each statement is true or false. 1. The measure of an obtuse angle is less than 90°. 2. All perfect-square numbers are positive. 3. Holt Geometry 2-1 Using Inductive Reasoning to Make Conjectures Welcome to our Unit on Logic. Over the next three days, you will be learning the basics. Holt Geometry 2-2 Conditional Statements Warm Up : Photographers and Cannibals Three National Geographic photographers and three cannibals are traveling. Pre-AP Bellwork 7) The radius of a circle is 4 feet. Describe what happens to the circle’s area when the radius is doubled.